Tears streamed down Cecille’s face as she talked about losing her boyfriend of 10 years to Hurricane Maria. A mudslide swept him away while he was sleeping in his home in the U.S. Virgin Islands. “When we were searching for him we didn’t find him right away, we found him four days later,” Cecille said. Cecille also lost a dear friend when Hurricane Irma pounded the islands. 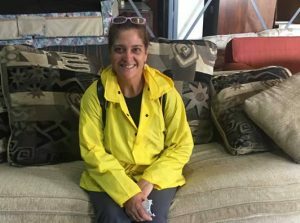 Losing loved ones and experiencing the punishing fury of two Category 5 hurricanes – Irma and Maria -… was enough for Cecille. She relocated to Orlando in October after having lived in the U.S. Virgin Islands for 34 years. Cecille lived in shelters in Orlando for several months before recently securing a stable home. She now has furniture to fill her empty home thanks to donors like YOU.